If you have a left-handed child, it’s nice to know that left-handers worldwide will unite on 13th August 2015 to mark International Left-Handers Day with a tongue-in-cheek celebration of the many talents attributed to their hand dominance. It is a day to enjoy the advantages of creativity, intelligence, artistic and sporting prowess. But for left-handed children, learning new skills with right-hand bias in tools and layouts can present practical difficulties that often lead to awkward clumsiness and bad writing style throughout their life. Your child may well show signs of being left-handed long before he/she is old enough to pick up a pen, often at 3 months+ when they first start putting finger food to their mouth with their dominant hand, or sucking their favourite thumb. Use these tips from the Infographic https://www.lefthandersday.com/teachers/child-info or pass them on to their nursery or pre-school to make life a bit easier for them. 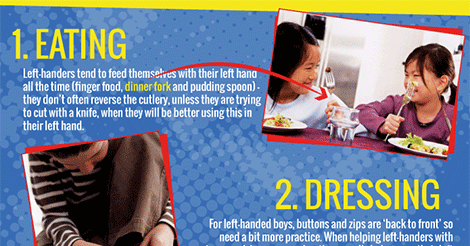 Eating – Left-handers tend to feed themselves with their left hand all the time (finger food, dinner fork and pudding spoon) – they don’t often reverse the cutlery, unless they are trying to cut with a knife on its own, when they will be better using this in their left hand. Dressing – For left-handed boys, buttons and zips are ‘back to front’ so need a bit more practice. When helping left-handers with trousers/shoes, remember they usually balance on their left foot first, so have the right leg or shoe ready for them to step into. Shoelaces/ties – A good tip is to stand opposite the child when demonstrating tying a tie or laces. This provides them with a mirror image to copy. Wind-up toys – Left-handers naturally turn in an anti-clockwise direction. If a left-hander is frustrated with a toy, it may be because it works back-to-front for him/her. Try alternative toys with cogs and wheels that work equally well with the handle turned anti-clockwise, or press button activation. 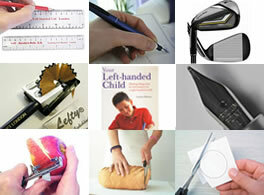 Cutting – Do ensure your child has access to fully left-handed scissors for all craft work. These have the blades reversed so they work properly left-handed. Find out how left-handed scissors are distinguished (for instance with different coloured handles or ribbons) and ensure your child understands the difference and knows to ask for her type of scissors at home and nursery. Check that there are enough pairs for all the left-handers in the group to use and they are not given out to right-handers by mistake! Pencils and Crayons – Encourage a good pencil grip as soon as your child starts playing with paint and colouring, to make the progression into writing style simple and painless. Oversized triangular crayons and pencils help develop the ideal tripod grip that left-handers need to avoid smudging and cramped grip as they learn to write. Always ensure pencils/crayons/toys and so on are placed directly in front within easy reach of either hand. Reading & writing direction – Left-handers naturally work from right to left across a page. Be aware of this when your child starts drawing and reading simple words and letters. Remind them to start at the top left of a page when reading and starting to form letters, and don’t be surprised if they form some letters backwards or read a word back to front until they have mastered the direction they need to go in. Lefties have a talent for transposing images in their heads so can often read and write backwards with ease! A star in the top left of reading flash cards, computer screens and blank writing pages can be a helpful reminder of the correct side to start. The Left-Handers Club is the leading pressure group for left-handedness, with over 100,000 members worldwide, providing information and advice on all aspects of left-handedness and raising awareness of related issues. Popularity of Left-Handers Day 2014. 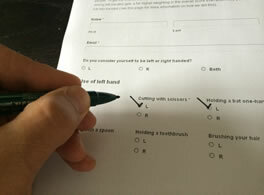 The Left Handed test was a big success with 50,000 participants. On Twitter the #lefthandersday hashtag was top 4 trending topic globally for 12 hours. Magnificent goods from you, man. I’ve understand your stuff previous to and you are just extremely fantastic. I really like what you have acquired here, certainly like what you are stating and the way in which you say it. You make it enjoyable and you still take care of to keep it wise. I cant wait to read much more from you. This is actually a tremendous web site.